Nicaraguan bishops and clergy were attacked by armed groups aligned with the government on Monday as violence in the Central American country escalated. Source: Catholic Herald. Cardinal Leopoldo Brenes Solorzano of Managua and his auxiliary, Bishop Silvio José Báez, and Archbishop Waldemar Stanislaw Sommertag, the apostolic nuncio, were among clergy from Managua pummelled as they attempted to protect St Sebastian Basilica in the city of Diriamba from an incursion by a pro-government mob. Bishop Baez and at least one other priest were injured. Journalists also were attacked and had cameras and other equipment stolen. The protests – originally triggered over reforms to the social security system in April – have claimed at least 300 lives. Seventeen people were killed on July 7 and 8 by police and paramilitaries in the cities of Jinotepe, Diriamba and Matagalpa, according to Amnesty International. 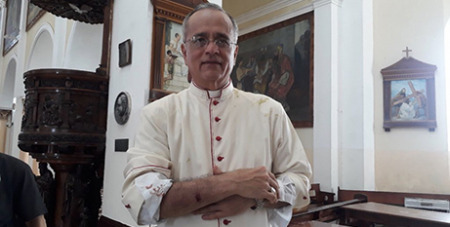 The Church delegation travelled to Diriamba to “show solidarity” with priests in the area after a massacre, Fr Victor Rivas, Executive Secretary of the Nicaraguan bishops’ conference told Catholic News Service. The Church in Nicaragua has been providing humanitarian assistance in its parishes and has tried to diffuse a worsening political crisis through talks.